One advantage of long periods of cloudy weather is the time it gives you to catch up on processing. I've had a shot of M3 sitting around for almost a month. I never processed it because it was an "end of the evening" afterthought. Low priority compared to getting my new planetary imager. Now that that's settled I took a look at it today. My first pass at processing it left it too yellow, and my in my second attempt I may have overcompensated. 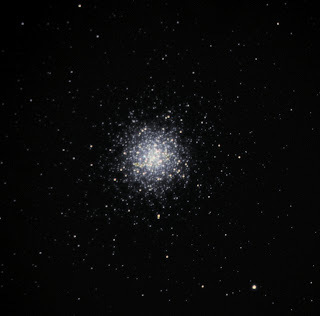 Messier 3. Click image for full size. The way things are going in terms of the weather I may not be able to resume my imaging Messier marathon project until the Wisconsin Observer's Weekend in early June.